3. Glue the edging on the drawer faces and case fronts. To minimize exposed end grain, glue the edging on the bottom first, then die sides and finally the tops. Sand flush. 4. Cut the lengths and widths of the veneer pieces (S through AA) for the cores (Photo 1). Make them a bit oversize to allow for trimming and joining. You want your glued together sheets to end up about 1" wider and 1" longer than their cores. 5. Layout the veneer strips in a bookmatched pattern. 6. The veneers are joined into sheets by edge gluing them together, much like you would regular lumber. First, joint the edges of the veneers on the jointer (Photo 2). 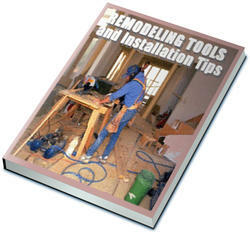 An alternate method involves clamping the veneer to a straight edge board and using a router with a flush trim bit. 7. 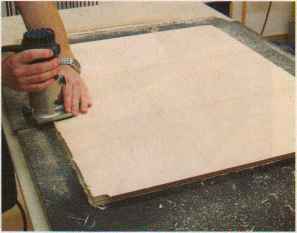 Lay the veneer pieces face down, pull the bookmatched edges together, and temporarily join them widi masking tape (Photo 3). 8. Flip the joined sheets over and apply gummed veneer tape on the face side the joint (Photo 4). 9. Lay a piece of 3/4-in. MDF over the sheet so it dries flat. 10. 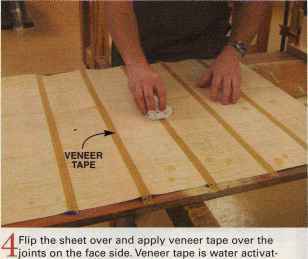 Lay the sheet with the veneer tape down on a work-table. Remove the blue masking tape. 11. Open the joints to apply glue (Photo 5). Lay the sheet flat again to close the joints and place sticks aside the joints to hold them down as the glue dries. When the glue is partially cured, use a paint scraper and gently remove any excess glue. Set die slicks on top again and let the glue completely cure. 12. Gather everything you need to glue the veneer sheets to their cores: crossbeams, cauls, newspaper or craft paper, veneer sheets, core, lots of clamps and glue. 13. 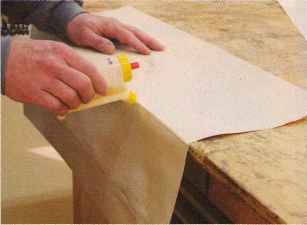 Use a narrow paint roller to apply a moderate coat of glue to one side of the core (Photo 6). Don't over do it. You should be able to see through the glue to the core. You can gauge how much glue is enough when the clamps are set. If a little glue oozes out at the edges, you hit the mark. Gobs of glue means you need to cut back a bit. No squeeze out and you're in danger of starving the joint. Do not apply glue to the veneer. 14. Lay the veneer sheet on the glue veneer tape side up. You'll scrape and sand the veneer tape off later. 15. Flip the panel over and veneer the other side. Cover the veneers with paper and place the panel between the cauls. Add the crossbeams and clamps (Photo 7). 16. When you start clamping, you put crossbeams on top and bottom in the center first and clamp dieir ends. Add die other crossbeams to the right and left of center, and then clamp around the outside edge. This will push any excess glue out from the center to the edges. 17. Let the glue dry 24 hours before removing the clamps. 18. Flush trim the overhanging veneer edges (Photo 8). Scrap off any dried glue on the edges and flush trim again. ed. Dip precut lengths of tape into a bucket of warm water. Apply the tape, then dab off the excess water with a paper towel. 5 Flip the sheet over again and remove the blue tape. Apply glue to the joints. Using a small tip on the glue bottle makes this task easier. Lay the sheet flat until the glue dries. 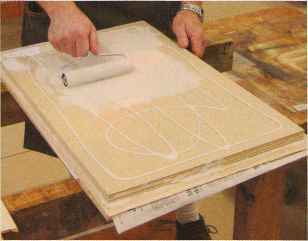 6Apply slow-set wood glue to the panel core with a paint roller. I thin the glue about 5% with water to make it flow easier. Add a bit more glue around the edges to make sure they are well secured. 19. Attach the front edging strips (F) to the fronts of the veneered case sides. 20. The procedure for gluing the drawer face and case front veneer sheets to their cores is a bit different. I find it's best to glue all three drawer faces (G, H, J) and the case front (K) at once on a single veneer sheet. Lay 3/8-in. x 3/8-in. x 16-in. spacer sticks between the faces to hold them parallel with each other. Make sure the center joint on the sheets is aligned with the center of each drawer face. That keeps the drawer knob holes centered on the joint. 21. Pull the spacer sticks out immediately after clamping. When the glue has dried overnight, draw lines across the center of each gap in the drawer stack and separate on the band saw. 22. Cut the case tops and bottoms (BB and CC), and the edgings (DD, F). Glue the edgings to the case parts. 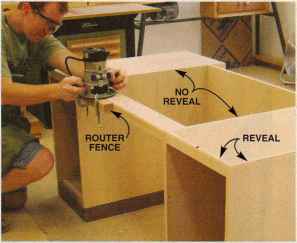 23. layout and cut the biscuit grooves and screw holes in the drawer case components as shown in Fig. A. The screw holes used to attach the front support QJ) are set down 1-1/8-in. to keep them clear of the case tops. 24. Cut the rear corners (EE) equal to the thickness of veneered case sides and backs. Glue them to the case backs. Assemble the case sides, tops, and bottoms. Glue the assembled case fronts to the case tops. Then, attach the backs. 25. Cut the base parts (FF and GG) to match the assembled cases. 26. Drill counterbore and clearance holes for the T-nuts that hold the adjustable feet. Then, assemble the bases with glue. 27. Cut the modesty panel base (HH) the same thickness as the modesty panel. 28. Rout 1/8-in. x 1/8-in. reveals (rabbets) on the tops of the bases and the top of the modesty panel base, both front and back. 29. Cut the supports for the desk front and modesty panel (JJ and KK). Cut biscuit slots in die modesty panel. Glue the support and base to the modesty panel. 30. Screw the bases to the drawer cases. 31. Dry clamp the front support and modesty panel between the drawer cases. Make sure everything is aligned and drill 7/32-in. diameter pilot holes for the confirmât screws. 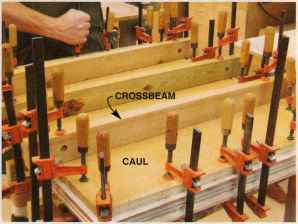 7Cauls and crossbeams on top and bottom distribute the clamping pressure evenly across the veneer panel. Make sure you have enough clamps on hand before you start. 8Remove the overhanging veneer edges with a laminate trimmer and a flush trim bit. Back cut the corners to avoid tear out. 9 Rout the 1/8-in. x 1/8-in. reveal around the top outside edges of the assembled desk, but not the modesty panel. There's no reveal inside the kneehole.The small reveal creates a shadow line that visually separates the desk components. reveals on the top of the case sides in front of the modesty panel until the desk is disassembled. For now, mark the end point of those reveals. 33. Measure the width and length of the assembled desk. Adjust the dimensions of the top components (LL, MM and NN) so the top fits the desk. Assemble the top (Photo 10). 34. Screw the top in place and check the fit. Then, disassemble the desk and complete the top reveals on the sides. 35. Cut the drawer parts (PP dirough YY). 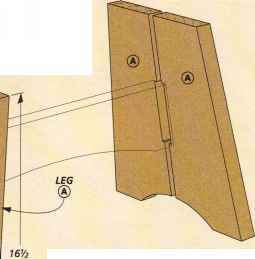 Note the dimensions given are for a jig that cuts 5/16-in. deep sockets for dovetails spaced 7/8-in. apart. Adjust the dimensions for your jig. I leave the drawer bottoms Tin. wide for now. 36. Rout the drawer dovetails and cut the drawer bottom grooves in the drawer box fronts and sides. 37. Drill die 3/Tin. dia.. x 1/8-in. deep counterbore holes and the 5/16-in. dia.. through holes in the drawer box fronts for the screws that attach the drawer faces (Fig. A. Det. 1) These holes have a little play so the drawer faces can be adjusted a bit. 38. Drill the knob holes in die drawer faces. Drill a 3/Tin. dia.. hole in the letter and pencil drawer fronts for accessing the knob screw. 39. Assemble the drawers (Photo 11). Use the drawer bottom to square die drawer. When die glue dries, remove the drawer bottom and trim to final width. 40. Bevel die bottom edges of the file drawer faces 10 degrees (Fig A. Det. 2). 41. Final fit the drawer faces (Photo 12). 42. Mount the drawer slides to the drawers and cases (Photo 13). 43. Align and clamp the drawer face in position. Then, slide the drawer out and screw on the drawer face (Photo 14). Not having the drawer bottom in place is a real benefit here. 44. Disassemble everything and finish sand. Be careful sanding the veneer. It's veiy thin and easy to sand through. 45. Apply your favorite finish. I had my desk professionally finished with sprayed on catalyzed varnish. A brush-on polyurethane is also good choice. 46. Slide the drawer bottoms in place and staple or screw them to the drawer backs. 47. Fabricate and attach the file supports (ZZ) from aluminum angle. Use #0000 steel wool to clean up the aluminum. 48. Hammer the T-nuts into the bases and insert the levelers, and then reassemble everything. I / iiGlue the walnut edging to the top panel.The 1 v/edging is mitered so it's best to apply one piece at a time and fine-tune the fit as you go. Make sure the edging stays perfectly flush with the top. | 1 Glue and clamp the drawers together. Notched JL JL clamp blocks push the side dovetails into the dovetail sockets. The drawer bottom is temporarily slid in place to square up the drawer.